Simple and stylish, this chic adjustable slider bracelet will add an extra touch of charm to your look. Available in sterling silver, or 18-karat yellow or rose gold over sterling silver, this bracelet features a box chain, lined with 14 round, polished beads that create a subtle but sophisticated design. A slider bolo clasp completes this trendy bracelet. Wish more slider bracelets were available. Bought in all gold tones-gold, silver and rose. Wear together to with other bracelets. So comfy, easy to tighten and loosen. Wears easily with everything. 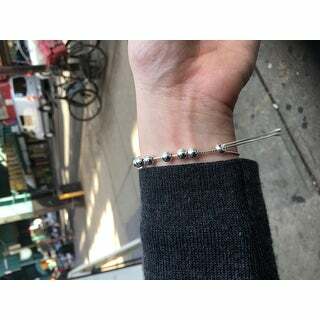 Beautiful Sterling Silver bracelet. Just love the style! I love this bracelet! I actually bought three, and wear them all together, and sometimes with other small bracelets interspersed between. Or, this bracelet looks beautiful on its own. It took me a minute to figure that the lariat style bracelet requires pulling a bead down to make the silver strands open wide enough to put it on. But once I figured it out, it was very easy to put this bracelet on and off. I'm also pleased that the bead that holds everything in place stays put, so that the bracelet doesn't enlarge while I'm wearing it, and possibly fall off. No worries about that. This is just a really cool, hip, light, delicate, but classic Lee designed bracelet. I highly recommend it for people of all ages. Again, as I said, it looks good on its own, paired with more of its kind, or interspersed with other bracelets. It's a very nice addition to a bracelet collection. It is unique, the classic. 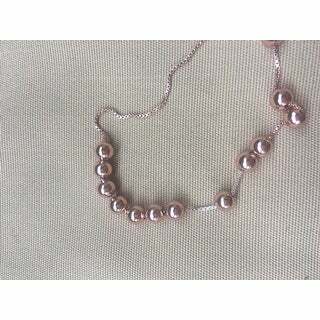 It's basically a series of silver beads, and it rolls slightly on the arm while you wear it and is very flirty and attractive. I bought a few of these in various styles: sterling silver, rose gold, and yellow gold. Everyone loved them! I have one as well, and I love it too. It's made well, a decent weight and exceptionally priced. I thought the beads would be Sterling silver as well but they're plastic. And also the "rose gold" color is a bit odd. The chain is nice tho. THIS IS A BRIGHT AND SHINY VERY PRETTY SILVER BEAD BRACELET. SLIDER BRACELETS ARE SO INGENIOUS, THEY CAN BE ADJUSTED EASILY TO FIT MOST SIZES. Very nice bracelets. I bought in Silver and Gold. Love them! Would definitely recommend. Probably going to order in rose gold too. Excellent quality. Easy to put on with one hand with bolo chain. 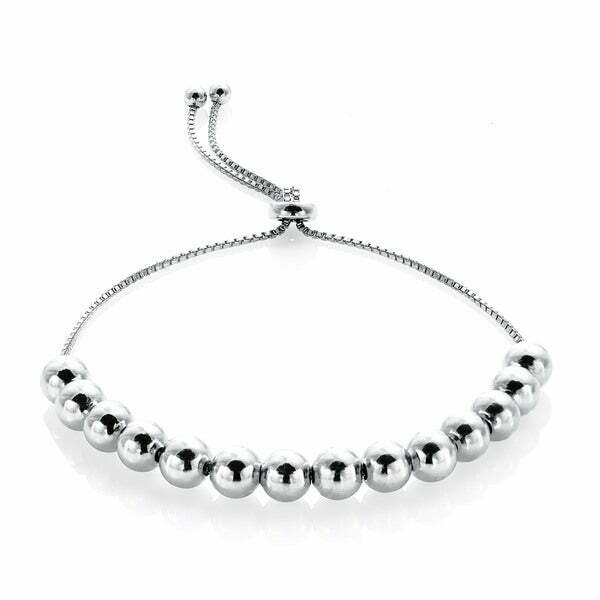 Beautiful Sterling Silver Bead bracelet. Was bought for a friend as a gift. She loved it. It is nicer than it looks in the picture. Thinking about getting another one for myself. Looks great with the Sliding Bead Necklace. Would highly recommend. Cute, but too small for an adult hand. I'll be returning. Only had a few days and it broke. I love the beads and chain. It is adjustable for any sized wrist. I LIKE THE ADJUSTABLE CORDS THAT HOLD IT ON YOUR WRIST - VERY FUN - LIGHTWEIGHT. ENJOYABLE PURCHASE. I love this bracelet, very light. Also love you can adjust the length. 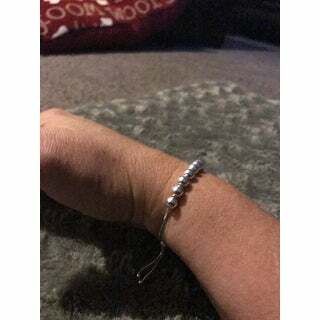 Cheaply made and would not stay tight on wrist. Fits any size wrist. Goldtone looks like real gold. Has a delicate feminine look,it wears well. I would recommend. Great bracelet. Very easy to put on. Love the size of the beads they are comfortable to wear. I had never owned a bracelet with this type of catch but it is easy to adjust and stays put. Beautiful! "When will this be back in stock in rose gold"
The rose gold is currently in stock. "Do you have a wholesale price? and where were these chains made? please send answers to my mail also: *** Course I don't visit this web often, tks. A.L." The most accurate pricing is listed on the product page. These bracelets are made in Thailand. "Can I add beads to this bracelet?" Hello Yellowroom, beads cannot be added to this bracelet. Thank you for shopping with us. "I have a 7.5 inch wrist. Do you think this would work"
Hello kprice1130, this highly polished bead bracelet fits from 4-inches up to 10-inches. Please feel free to contact us again with any further questions. Thank you for shopping with us! "What is the bead mm/or inch size. Are the bead all uniform in size or are they graduate ?" Hello lc1956, all of the beads measure approximately 6mm . Thank you for shopping with us. "Why does the description say from 4 to 10 inches???" Hello L.June B., this can be adjusted from approximately 4 to 10 inches. Thanks for shopping with us! "Is it all sterling or just plated in some areas?" Hello sweetaddictions, the bracelet is made of sterling silver. There is an option for rose gold and yellow gold plating over the sterling silver that can be found in the drop down menu. I hope this info helps. Thanks for shopping with us!